Blog post update 23rd July: It is not recommended to change the firmware ‘Update to’ setting. Leave that setting on its default, which is ‘Latest release’. When changed to ‘Latest release candidate’, the Color Control will participate in test programs, also known as beta versions. Of course you can set this, but we recommend to certainly not do it in every system you install, and not in normal customer installations. What for example might happen (worst case) is that there is a bug in the release candidate which can only be recovered by first performing a fresh software install from an SD card and then reconfiguring everything manually: not the right thing to happen in normal customer installations. 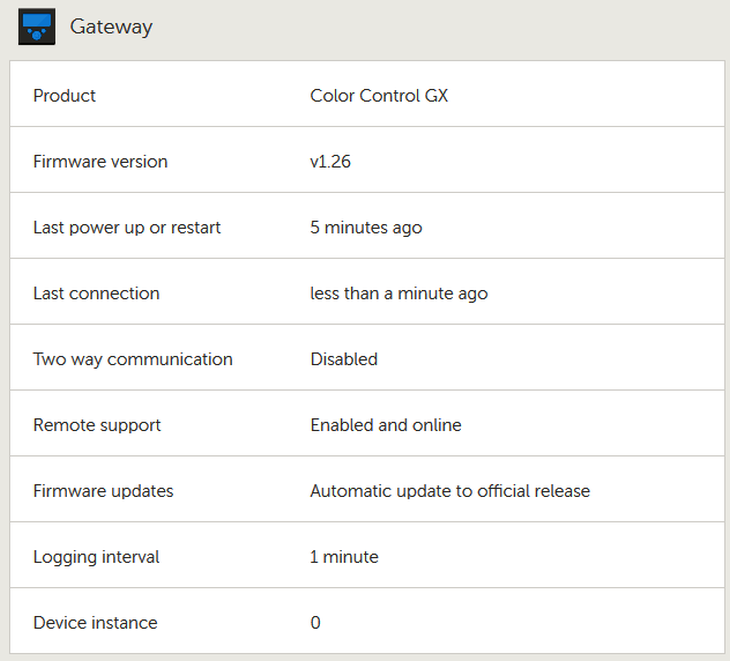 Firmware v1.26 is now available for your Color Control GX (CCGX). If your CCGX is set to update automatically as shown in the image above, it will have automatically updated in the early hours of this morning.